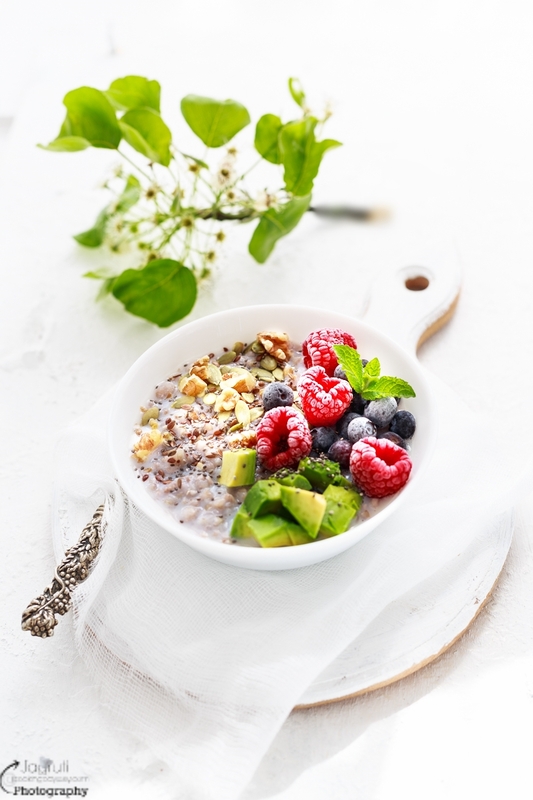 Cinnamon Buckwheat Porridge with Avocado and Berries, a healthy, gluten free and filling breakfast one can have. 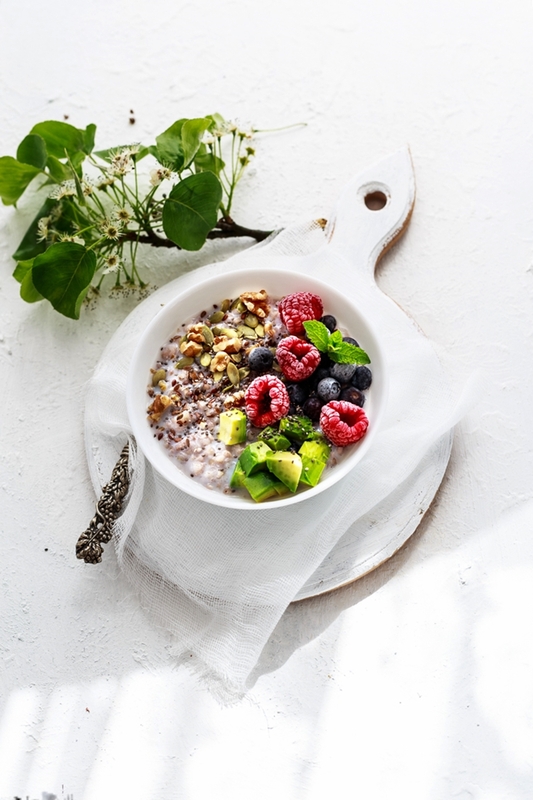 This version of porridge bowl is packed with nutrients, the avocado adds creaminess and provides healthy fats, berries lend a lovely zingy taste and sweetness. It provides a full of energy start to the day and keeps you full for longer. 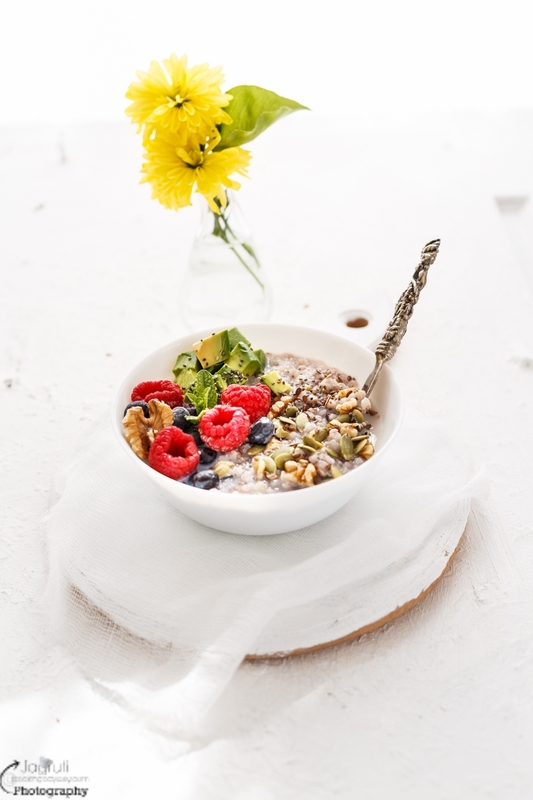 If you want to make it vegan, use vegan substitution such as nut milk, soy milk, rice milk or oat milk and maple syrup. I and my husband do admit that any kind of porridge is the best breakfast ever, premium fuel for the body, for us oat porridge is staple and part of our routine, we eat at least a few times a week, but buckwheat porridge is a new try in our kitchen since this new year, and we are hooked now because the outcome is delicious. 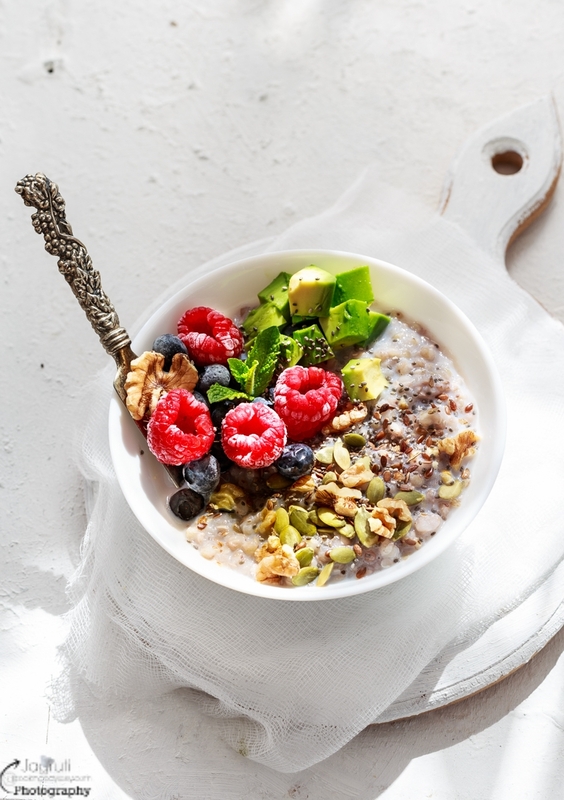 Currently, buckwheat is a 'hot favourite' and much-loved ingredient in our house, I cook it without any salt or fat, cool it and store in a refrigerator in an airtight container. 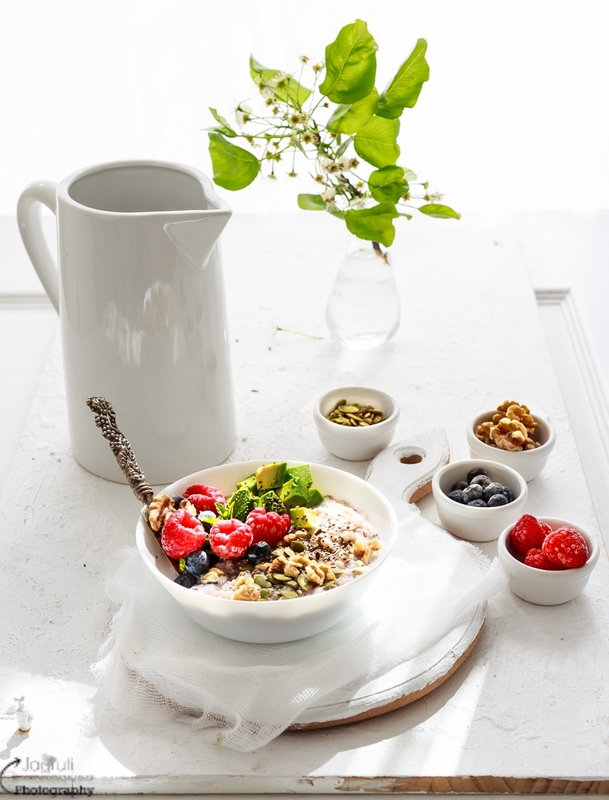 Boiled buckwheat is a great 'blank canvas' recipe, it adapts beautifully in sweet or savoury dishes. I use it in so many recipes, we really like the taste and the versatility of buckwheat. I absolutely love my recipe ' Buckwheat Upma'. 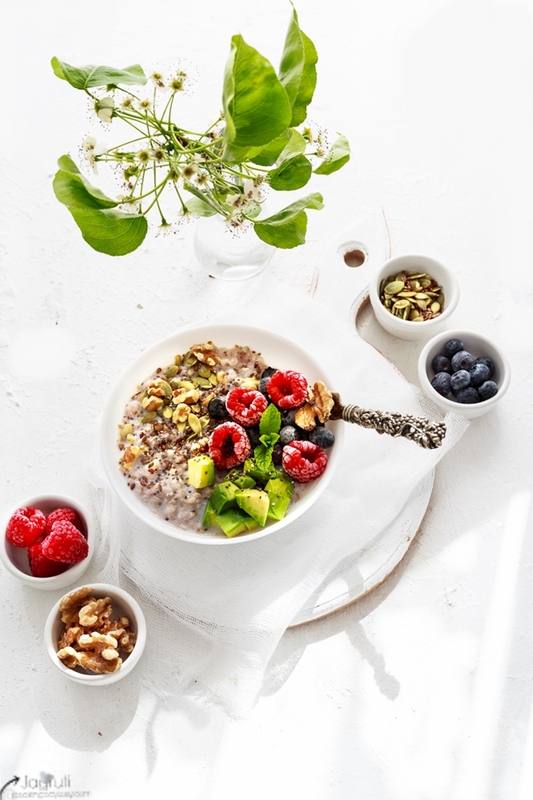 as much as buckwheat porridge too, I have no problem in wolfing down a hot buckwheat porridge in no time, however, I don't mind topping up my bowl with fruits, nuts, seeds, bee pollen and a little bit of cinnamon. It just makes it extra yummy !!! I do not add any type of sweetener into my porridge if you wish you can add sugar, jaggery, honey, maple syrup, agave nectar or date syrup. You can do the entire cooking process in a microwave. Place milk, cooked buckwheat and Cinnamon in a pan and cook on a low heat together for 4-5 minutes while stirring constantly. Reduce the heat and cook porridge for a couple of minutes. Serve with sliced avocado, berries, nuts and seeds or top with any toppings you like.